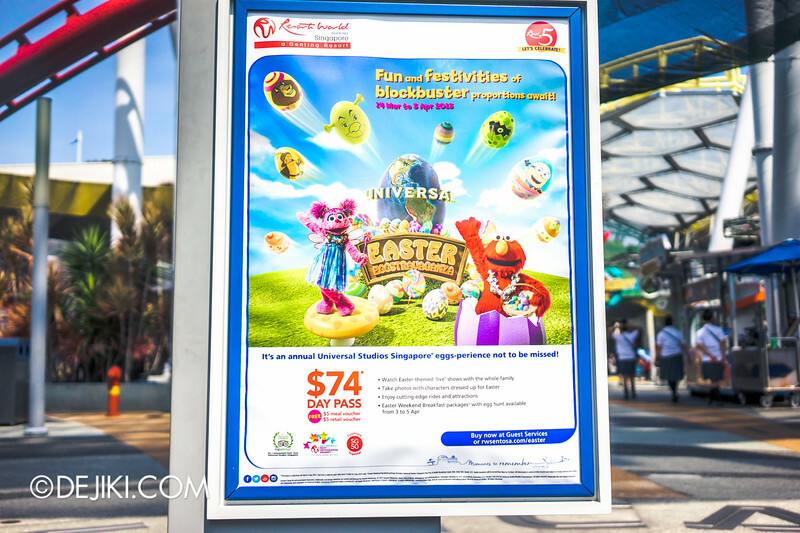 Find out what Universal Studios Singapore has in store for its 5th Anniversary Celebrations and Easter Eggstravaganza in this month’s park update! 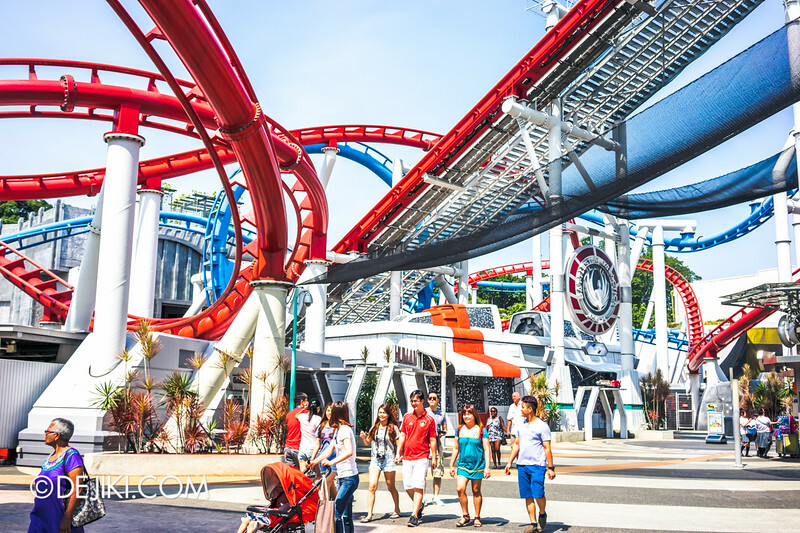 The long-awaited relaunch of the Battlestar Galactica: HUMAN vs CYLON (BSG) roller coaster attractions and opening of Puss in Boots’ Giant Journey ride have been pushed into the second quarter of 2015 – that is, from April to the end June. 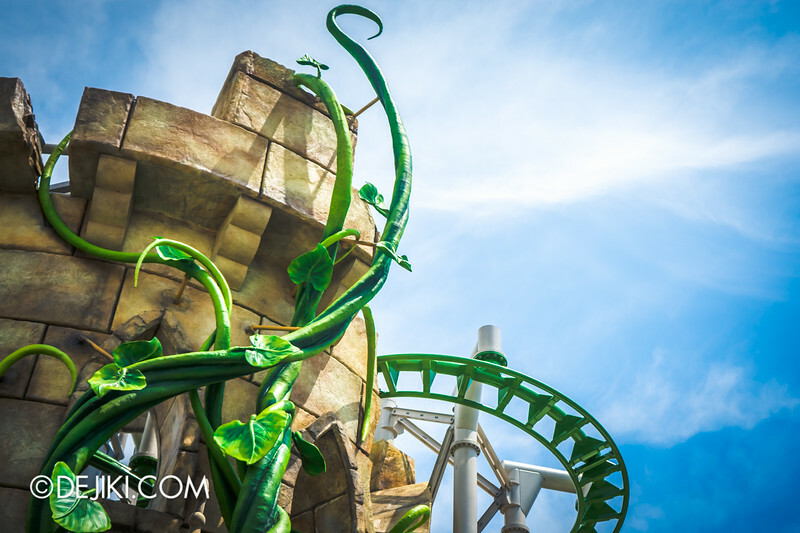 While testing of all three roller coasters are still ongoing, the frequency is noticeably reduced in early March. As the park has announced its event programme up till early April, it is unlikely that these attractions will open in March 2015. 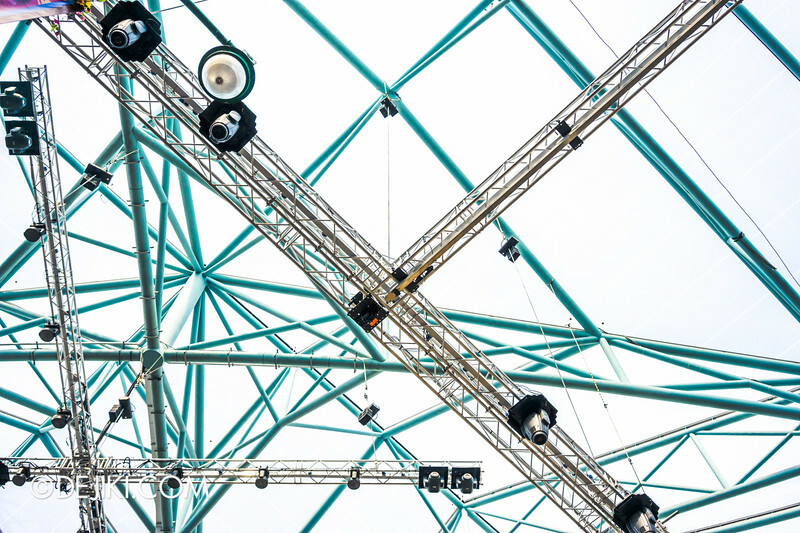 An NTUC event to be held on 3 May states that two new (thrilling) attractions will be available. This means that both attractions could open sometime in April 2015! – Thanks Jeremiah for the tip! Setting the launch for the rides later allows the park to have more events towards the mid-year lull. If you’ve followed the park for the last three years – there has never been a seasonal event in May-June. 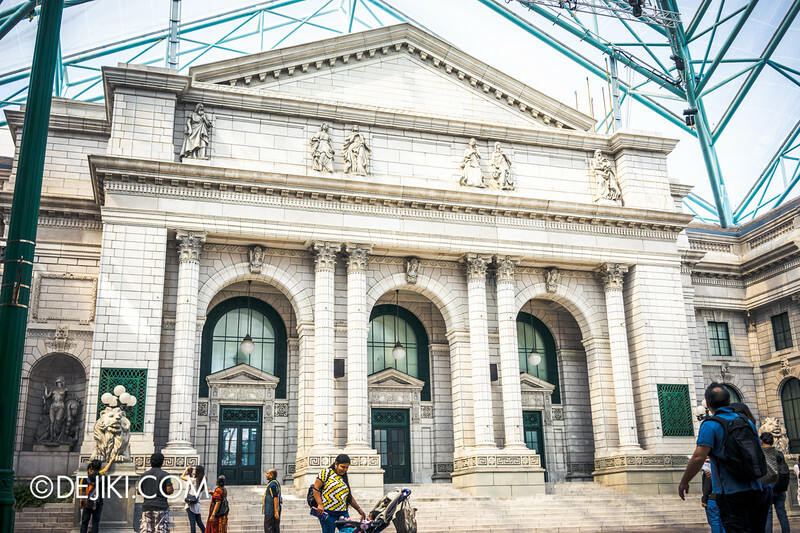 The school vacation would naturally boost park attendance, but big events make compelling reasons (or excuses) for guests to flock back to the park. It would be nice if Puss in Boots’ whirlwind, golden egg-stealing, adventure ride could open in time for Easter Eggstavganza, though? Strategically, timing ride launches in that period could spark a strong cadence towards the Halloween season and year-end festivities. However, I’m sure many would have mixed feelings to hear that the park’s flagship ride is only fixed in time after the park’s fifth anniversary. In case you missed it, the all-new ride vehicles for Puss in Boots’ Giant Journey were revealed on Dejiki.com last month! 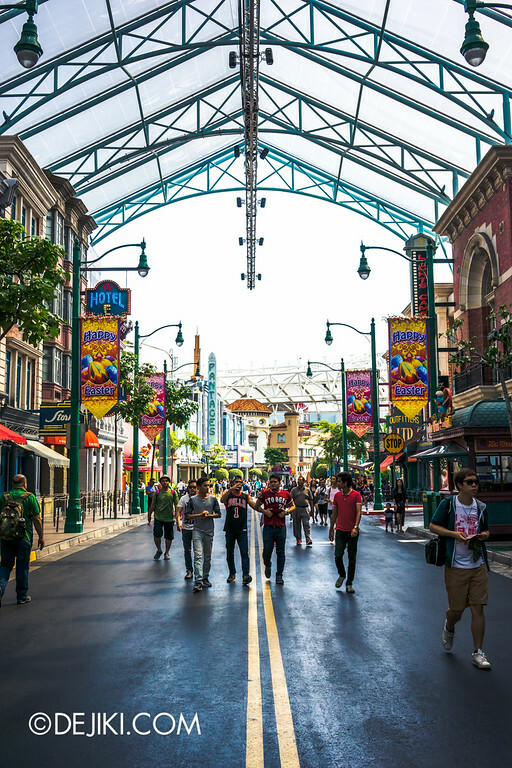 Universal Studios Singapore celebrates 5 Years! 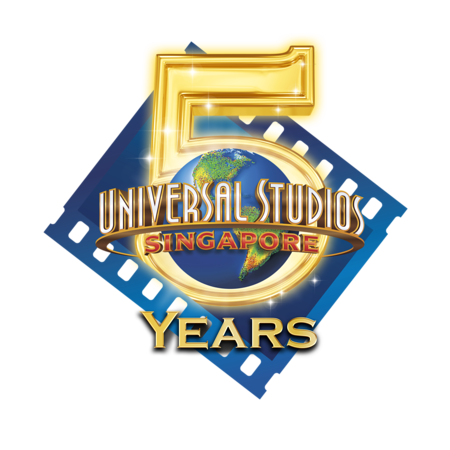 18 March 2015 – Universal Studios Singapore will celebrate its 5th Anniversary. 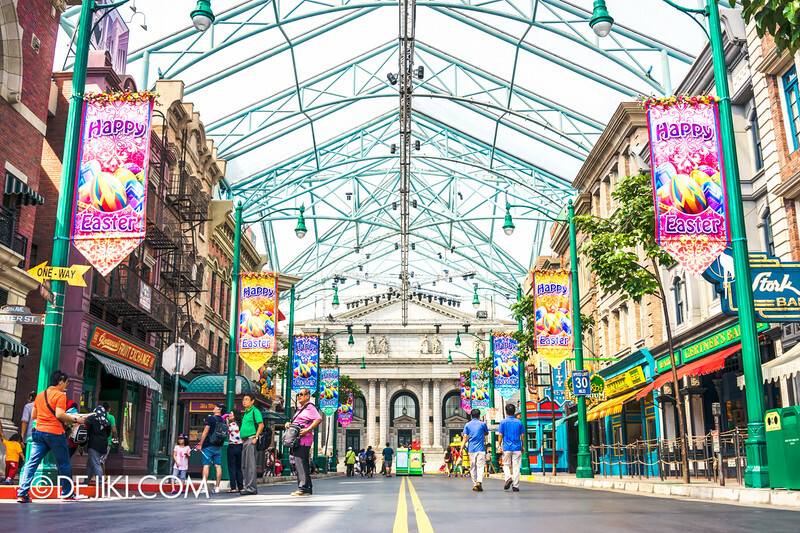 5 years ago on that date, Southeast Asia’s first Universal Studios theme park soft-opened to the public. 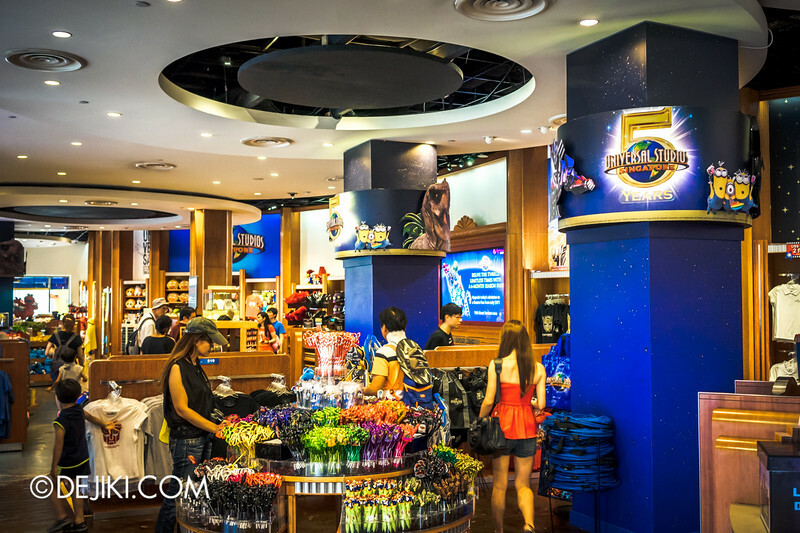 Unlike most other themeparks, USS’ 5th Anniversary celebrations are modest – with limited edition maps and cupcakes just for that special day. 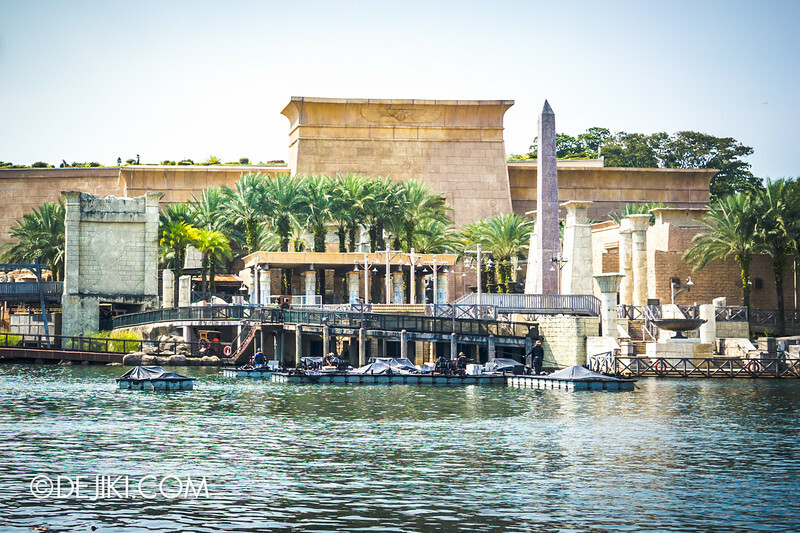 USS celebrated its Grand Opening with much fanfare some 13 months after its soft opening – perhaps we might see something of this scale for the 8th, or 10th Anniversary. 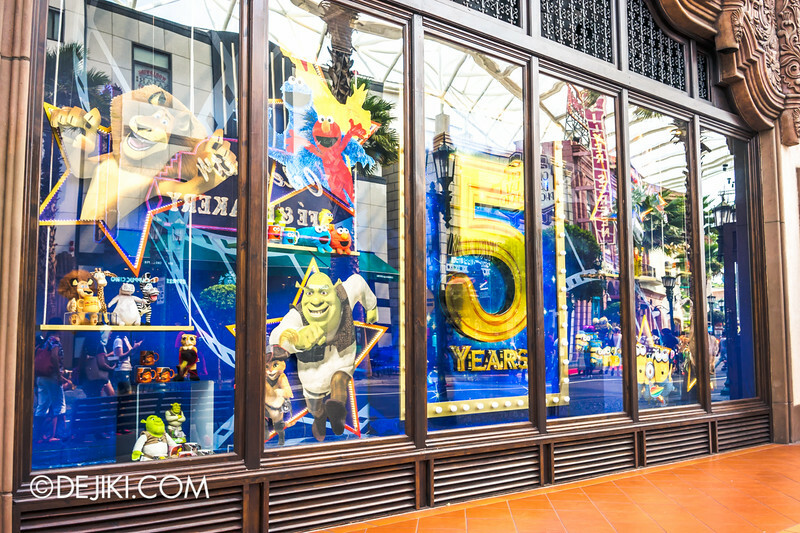 In the last few months, 5th Anniversary touches were added to the park, the most major being the renewal of Hollywood Dreams Parade (as the Universal Party Parade). 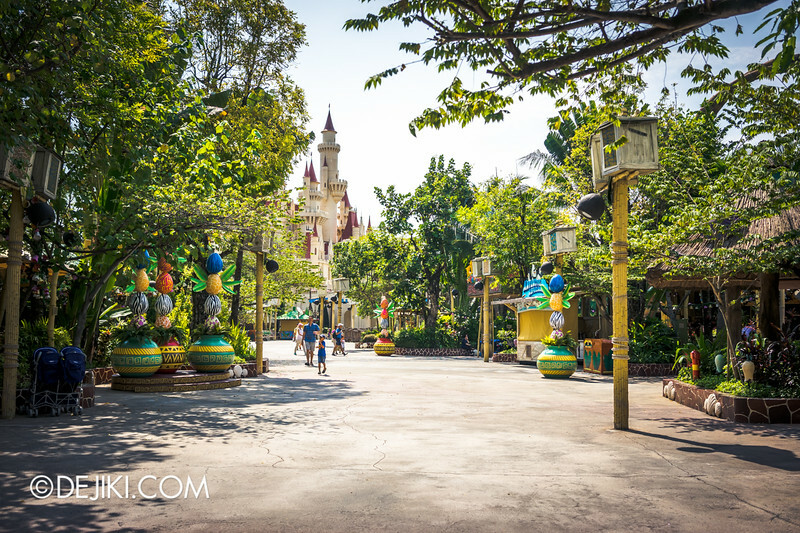 The park still uses the parade’s original name though – it’s quite a lot to change (uniforms, maps, posters and all) and they might just stick to the old name eventually. 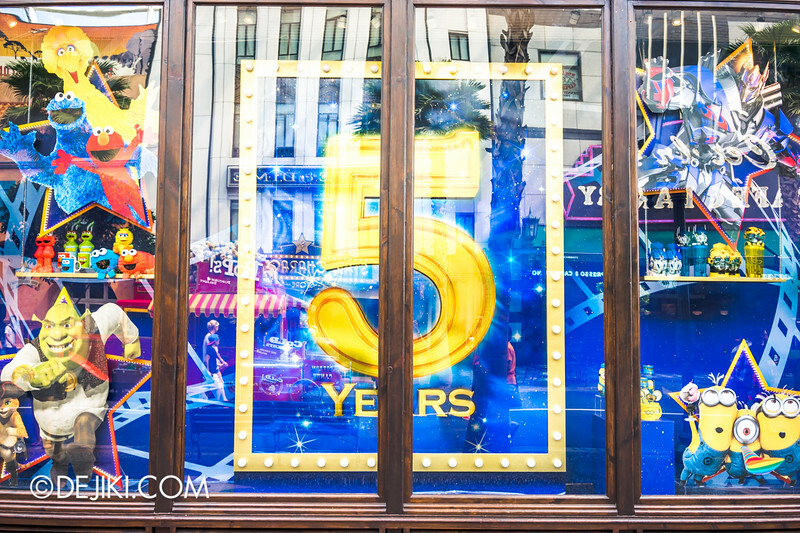 The Universal Studios Store at Hollywood zone has a fancy store window celebrating the park’s 5 years. There’s a facelift inside, too. 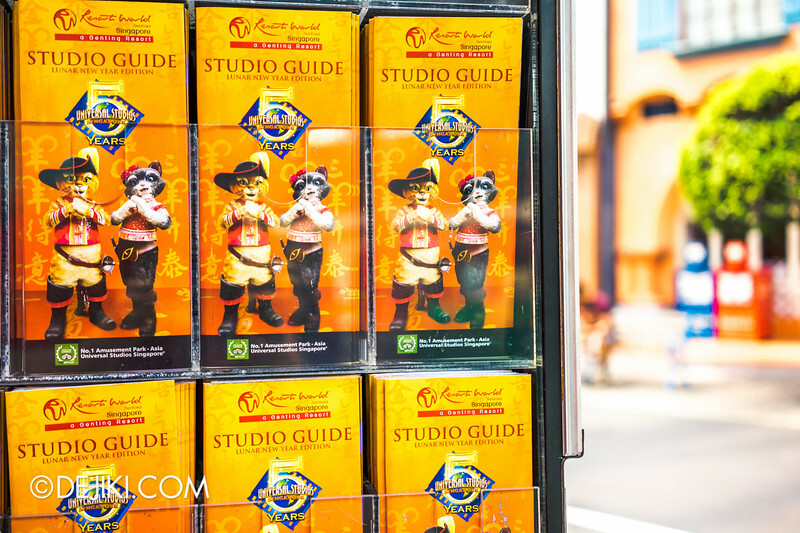 Upcoming Studio Guides will continue to carry the 5th Anniversary logo. Check over here for full event coverage of Easter Eggstravaganza,this year’s Easter Event! 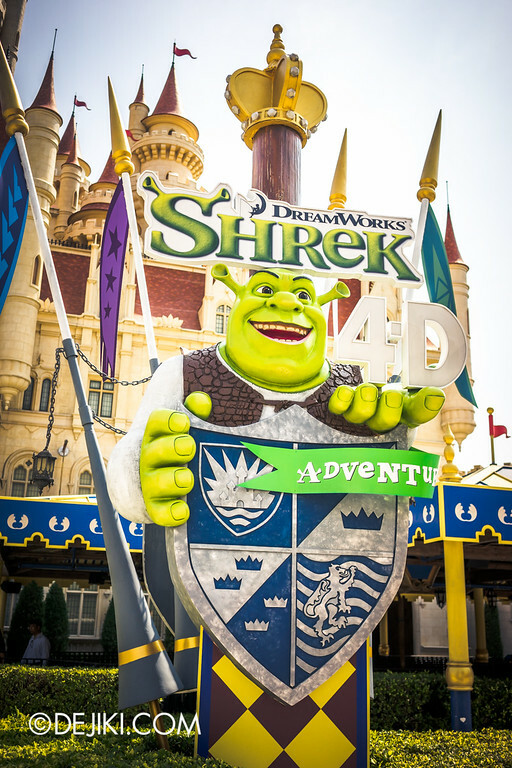 From 14 March to 5 April 2015, USS will be running its Easter seasonal event. 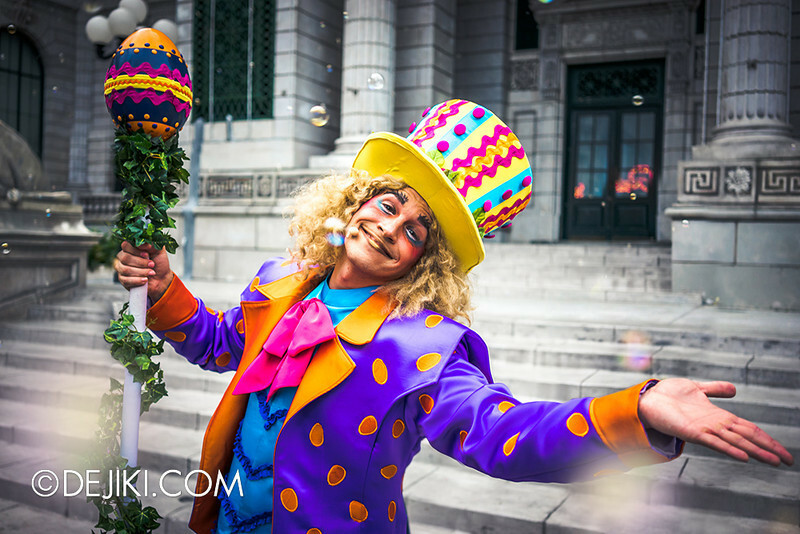 Known as the Easter Eggstravaganza, the event will see the return of The Egg Lord in an all-new show called The Royal Lunch at Eggingham Gardens. Taking place at New York, this “interactive stage show” will feature an original storyline and incredibly, will have the Egg Lord fly through New York in his “Hot Egg Balloon”. 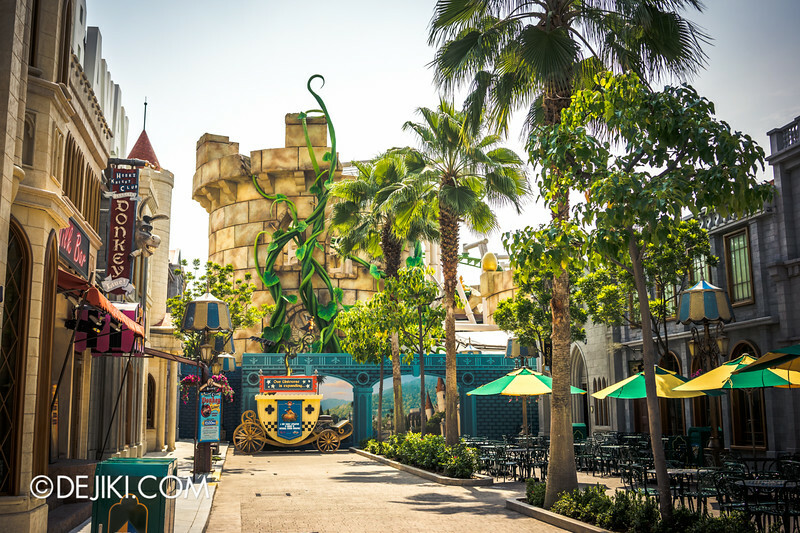 Egghingham Gardens will be set up inside Soundstage 28 (an event venue used for special events and haunted houses during Halloween Horror Nights). 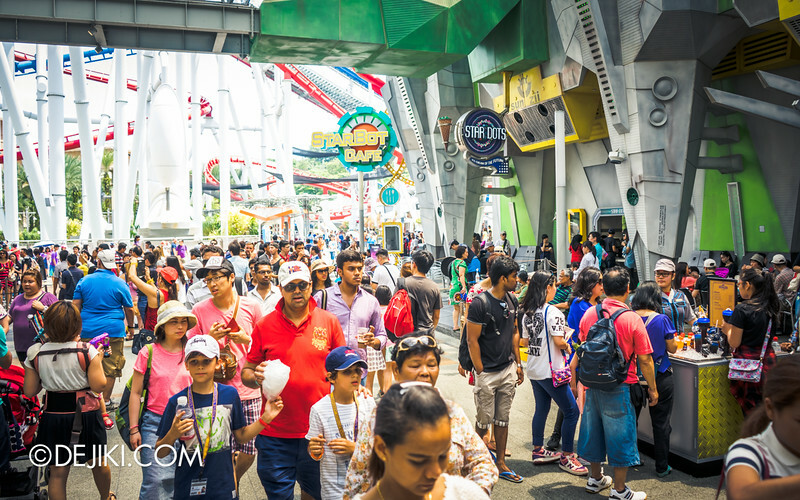 Day passes purchased for visits during the promotional period (14 Mar – 5 Apr 2015) will be bundled with a $5 meal voucher and $5 retail voucher. The Easter Egg hunt and breakfast event will return this year for the Easter Weekend (3, 4, 5 April 2015). Packages are available. The prices are slightly cheaper than last year’s event. 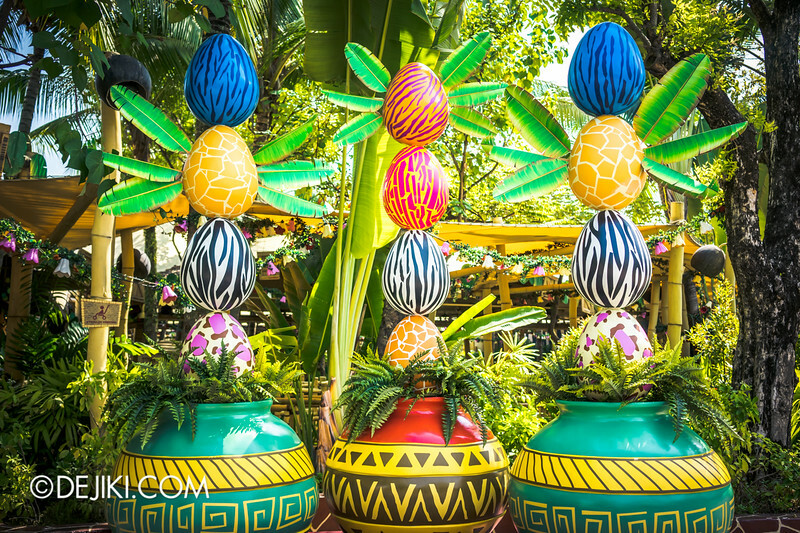 Check out last year’s Easter Egg Island event coverage, which includes the stage show, egg hunt and breakfast experience. 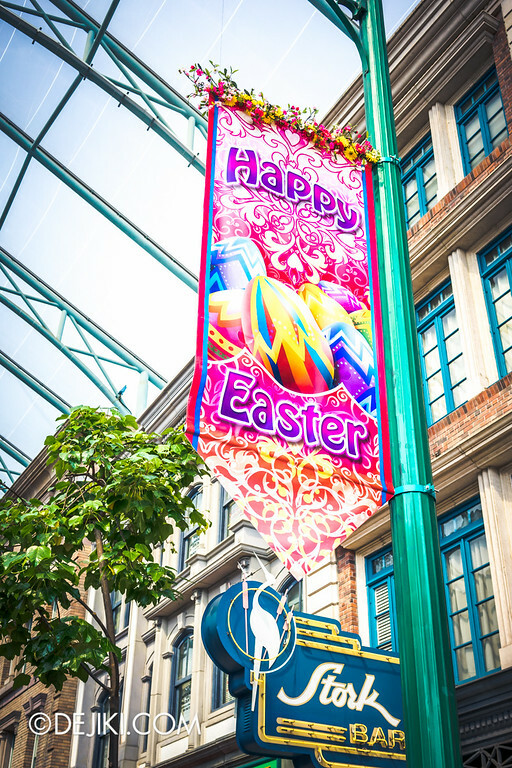 Some banners were added weeks before the Easter event, along with equipment for the Easter musical show. 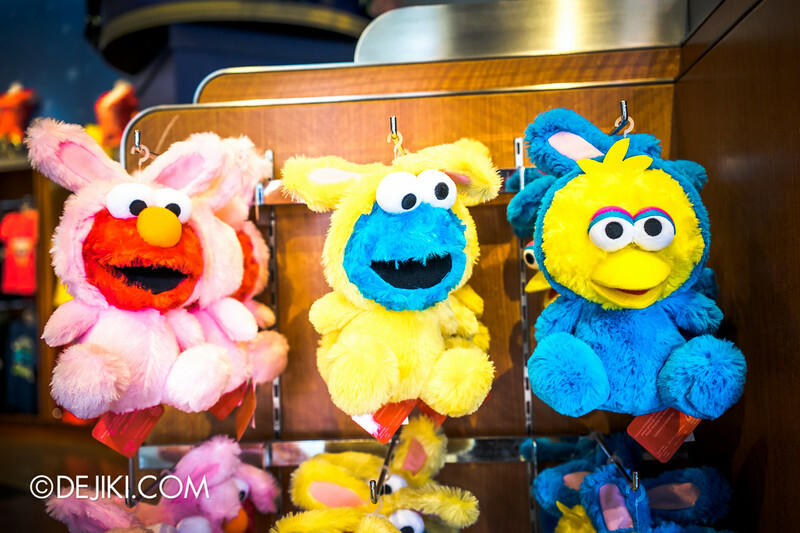 Some seasonal items were added to the park, such as these bunny Sesame Street characters – which are either too cute or disturbing. It looks like E.B. (Easter Bunny) will not return for this year’s Easter event. is back! He’ll be greeting guests in Hollywood and New York! Puss in Boots and Kitty Softpaws will however be decked in new seasonal costumes. There will be some Easter twists in The Dance for the Magic Beans street show, and both feline characters will be doing special Meet and Greets with their Golden Eggs. Hop over here for full event coverage of Easter Eggstravaganza,this year’s Easter Event! 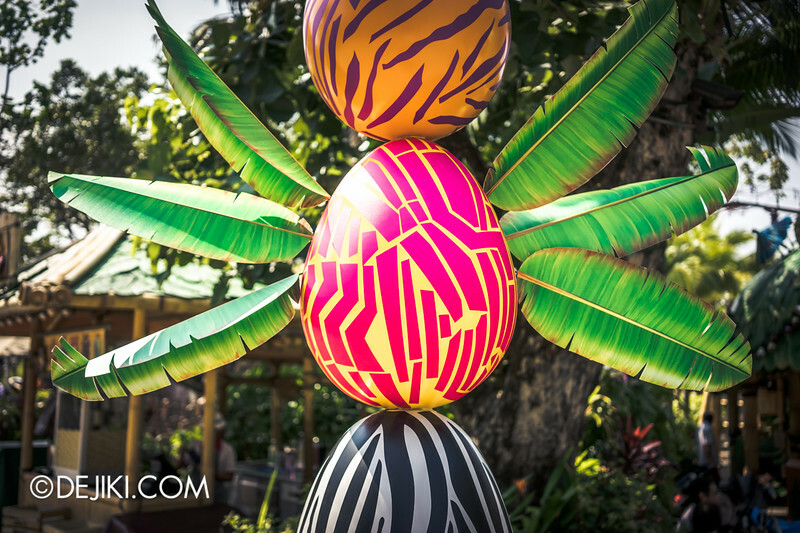 It won’t be just giant easter eggs in the park this year (See last year’s giant eggs here!). 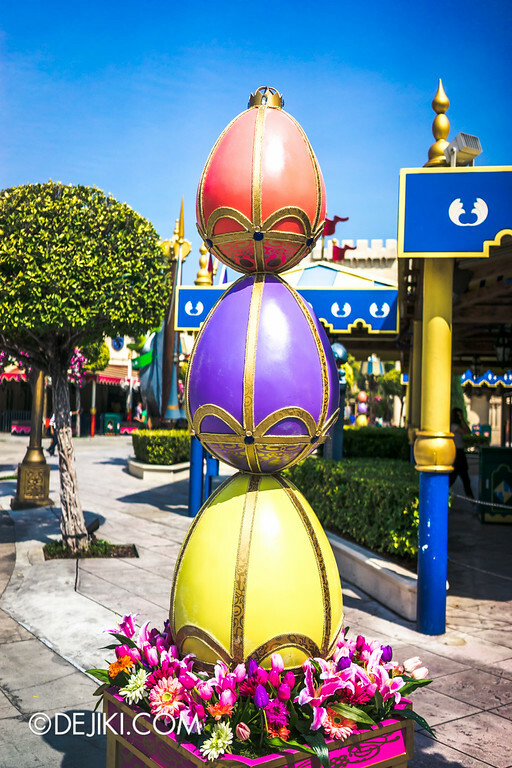 Some of the small, but still huge, eggs have already landed around the park’s Dreamworks zones. In Madagascar: Some interesting totem pole-like tower of eggs with animal prints. 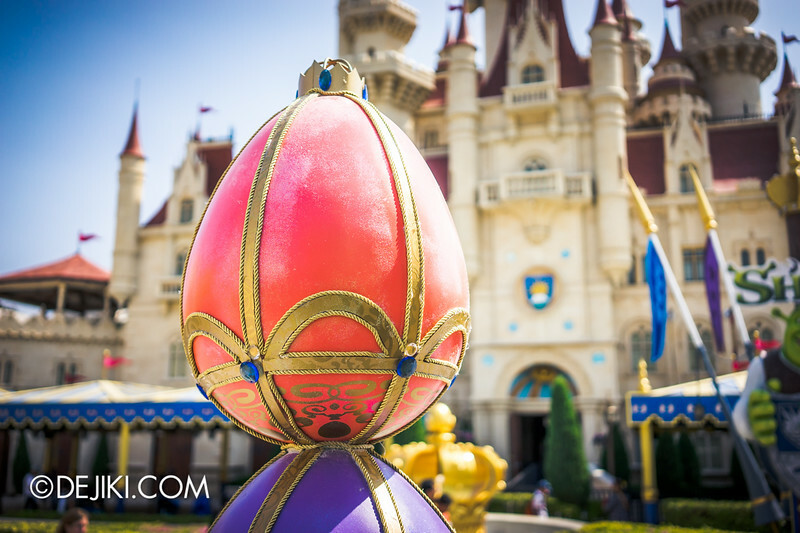 Bejeweled eggs for the royalty, exclusively at Far Far Away. 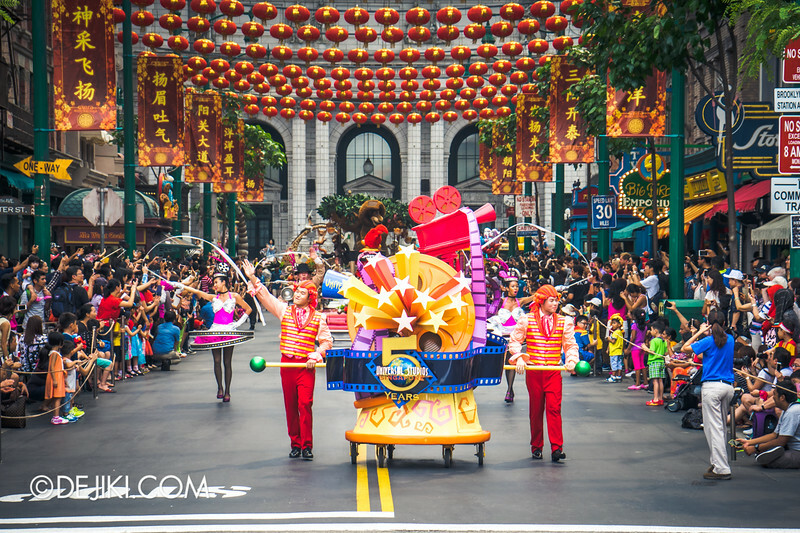 Were you at the park during the first few days of Lunar New Year? It was immensely crowded and busy! 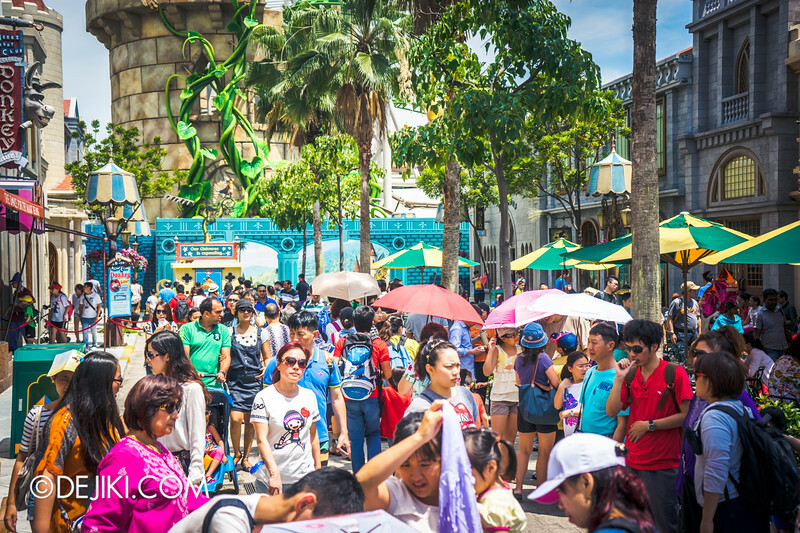 Wait times for the park’s most popular rides were at two hours or longer. Even Romeo Drive is packed. This is one of the quieter areas in the park. Fresh coat of paint! Park Refurbishment? Let’s face it – the harsh Singapore weather causes pre-mature aging. Not just your skin, but the park’s thematic structures as well. While there were small repairs and major paint work done before (Far Far Away’s awnings/tents, BSG in Late 2010 and Mid 2014), this is the first time I’ve actually seen it at many areas around the park. 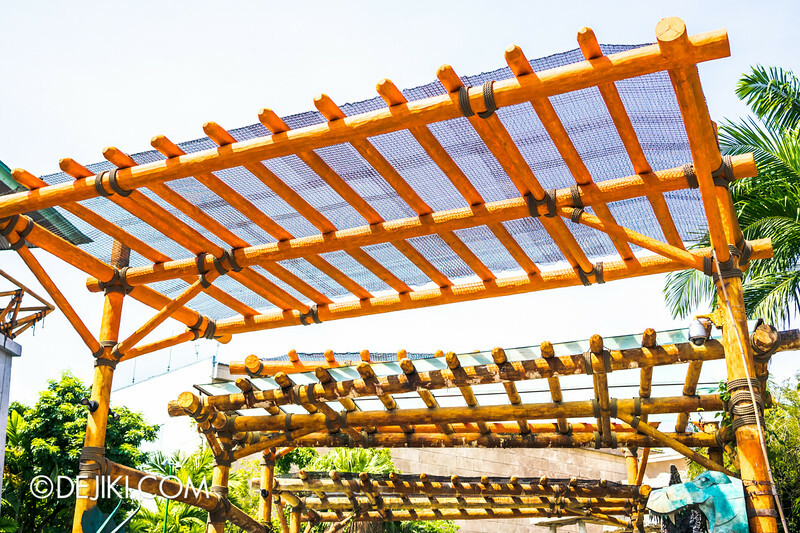 Some of the log canopy at Jurassic Park – finally back to its 2010 bright orange look. (The brown one in the background is not repainted yet). Unkempt, fraying ropes were all repaired too. 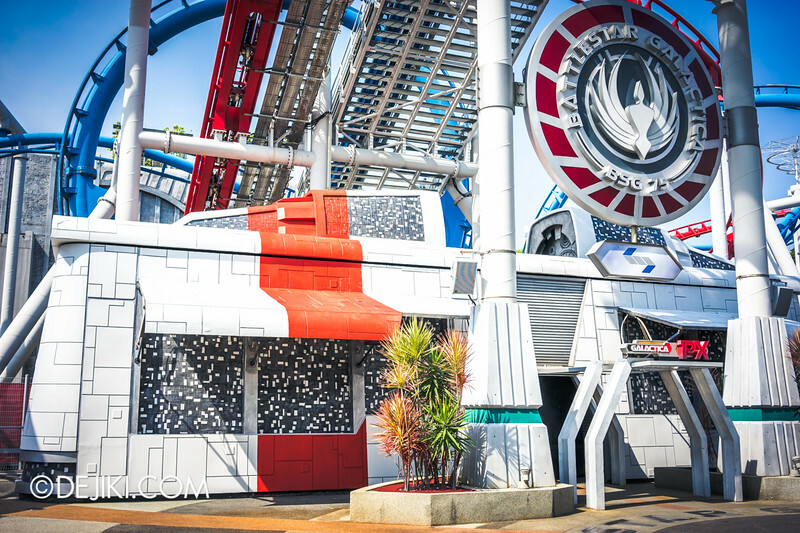 Over at Battlestar Galactica, both BSG ride entrances and Galactica PX are repainted on the outside. 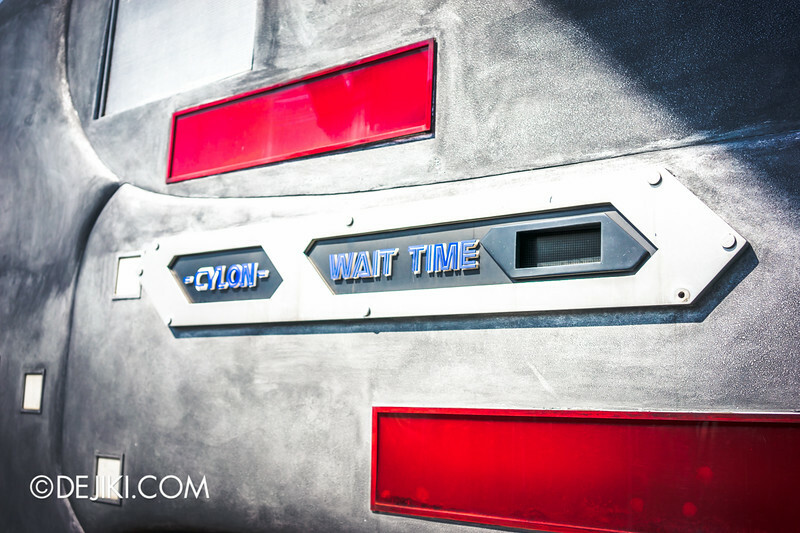 The CYLON entrance finally has its silvery shine. 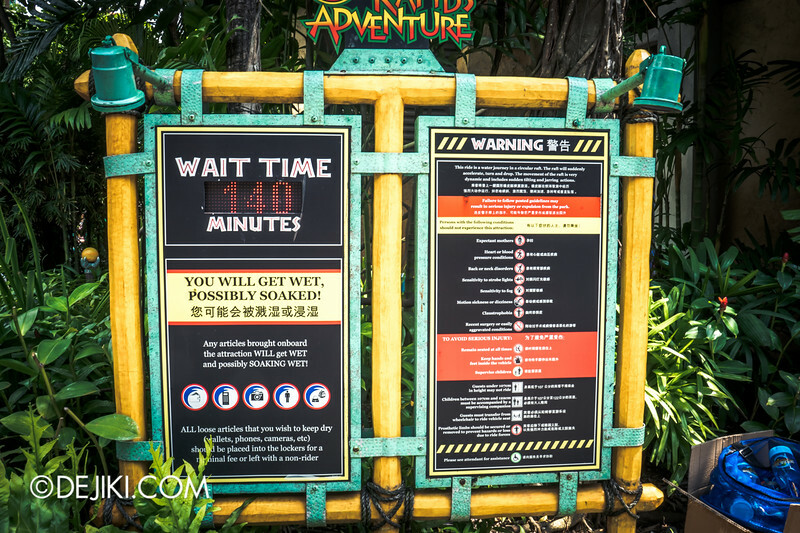 Some parts of the broken wait time indicator were repaired too. any idea if there’s anything special on 18th march? i am betting on a late apr reopening for bsg. just in time for the may/june holidays. I am planning to visit Singapore & see also Universal Studio by June this year. Any special activity or event coming up ? I’m excited already ! just wondering and needing an opinion about express pass. do you think it’s best for me to buy one? cos i’ll be going to uss on 4th June and from what i’ve researched it’s school holidays 🙁 or since it’s on a weekday it wouldn’t be so packed? i just don’t wanna waste too much time on waiting line. thanks for your help! 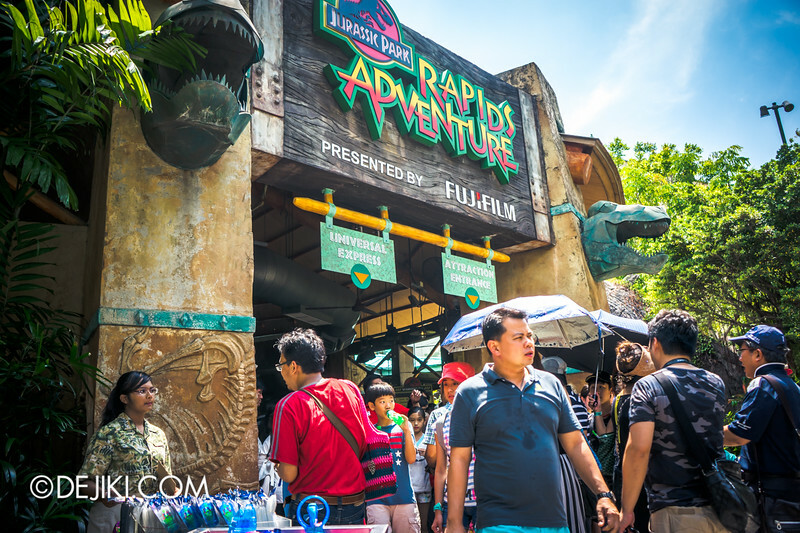 The best thing to do is to visit the park early and go for the popular attractions first, such as: Puss in Boots, Jurassic Park Rapids Adventure, Transformers, etc. You can decide if an Express Pass is necessary and purchase it when you are at the park.